"The Adelante Movement is committed to getting at least one of our Adelante women on a reality show, promoting her brand and her business, thanks to Hollywood Star Reality Casting Director, Sheila Conlin." If you missed our announcement, watch the webinar HERE. 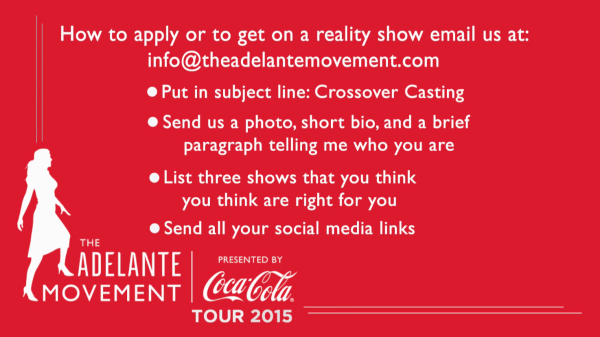 It is not too late to apply to be cast in a big television reality show! We have one more Summer School webinar on Sept. 2nd @ 10am pst / 1pm est called, “How To Become A Rich Latina”. It is the third in a trilogy of webinars culminating in an understanding of why it is important to have a rich life, and how to attain it. Today, we all woke up to the stock market having a scary fall and all the newscasters declaring there could be another recession. As we know, this is part of life; the ups and downs of things that we cannot control. So many countries are having economic crisis and defaulting on borrowed money, and that affects all our well beings - we are all connected in many ways but particularly financially, worldwide. However, there is one thing we can control. If we are on the path of becoming self-made (our mindset clear on goals and not instant gratification), if we take the steps to our financial well being and we are self reliant, we can sleep at night because we will be fine through any obstacle and any ups and downs in the world. Please join me for HOW TO BECOME A RICH LATINA on Sept. 2nd @ 10am pst / 1 pm est. I’ll tell you how to live a rich life in every way and why it is important to do so. If you missed our first two webinars from The Adelante Movement Summer School, please catch up from home. I promise you won’t regret it.